The bolt carrier group is the heart of any AR10/AR15/M4/M16 type rifle, carbine or AR pistol. Bet-your-life dependability is a non-negotiable prerequisite. We carry Aero Precision, Toolcraft and Fail Zero BCGs with Nickel Boron, Black Nitride, DLC, Chrome/Magnesium Phosphate and Titanium Nitride finishes with M16 profile carriers. Chances are we have the AR BCG that you are looking for. There are many decisions to make when choosing parts for an AR15 build. 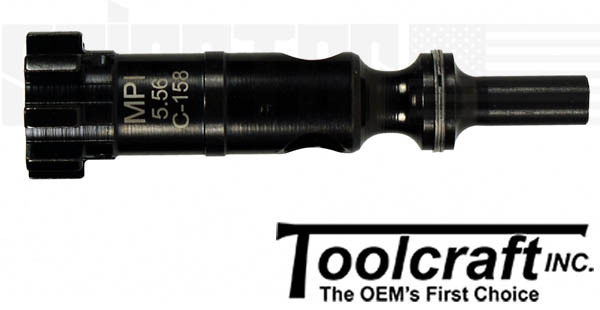 Whether you are putting together an AR pistol, rifle or carbine, no decision is more critical to the proper function of the system than the choice of Bolt Carrier Group. Luckily, SpiceTac has you covered with a variety of BCGs from Toolcraft, Aero Precision and Fail Zero. We have expanded our selection of bolt carrier groups and now offer a variety of different finishes. Below: Nickel Boron is a top of the line coating with a superbly smooth finish. It is engineered to minimize friction by cutting down the surface to surface contact between sliding parts. This finish not only reduces friction, but it also dissipates heat, allowing for less wear and tear. It has a natural lubricity and is easy to clean up while having a shiny silver look that complements a black rifle nicely. Below: Ionbond Diamond Like Carbon (DLC) Coating is a state-of-the-art metal finish applied through a Physical Vapor Deposition (PVD) process. It is an extremely tough, corrosion proof coating, with excellent low-friction properties. Ionbond Black DLC will not chip, crack or peel, providing you with years of reliable function and protection against wear. It is so strong that it is virtually scratch proof. It has an attractive gray graphite-like appearance. Below: Black Nitride, also called Salt Bath Nitride (SBN) or Quench Polish Quench (QPQ), is a form of nitrocarburizing or Thermo Chemical treatment that creates a hard durable finish that improves wear and corrosion resistance. A Black Nitride BCG will be very easy to clean and has a rich deep black color. Below: The original MIL-SPEC Chrome and Magnesium Phosphate finish combines a classic appearance with reliable function that has served well for generations. This phosphate finish holds the lubricant and ensures the carrier runs smoothly round after round. While the finish is the visible part of an AR15 BCG, it’s what lies beneath the surface that can make the difference between a good BCG and a great one. Every component of the bolt carrier groups we sell is manufactured from the finest gun-quality steels available. Bolts are made from either mil-spec Carpenter 158 steel or high strength 9310 steel. Each type of steel is very popular and in wide use for AR15 and M16 bolts due to superior strength and toughness. All bolts are MPI inspected and, depending on brand, will be either batch or individually High Pressure Tested (HPT) as well. Currently all our bolt carrier groups from Toolcraft, Aero Precision and Fail Zero come with full auto M-16 style carriers. This adds about an ounce of weight to the carrier and it is preferred for many AR15 builds. At SpiceTac we stand behind every BCG we sell because we have used all of them. Whether you are looking to buy the best bolt carrier group for a build or just need a spare, any choice from our catalog will be a fine addition to an accurate and dependable AR15 and will give you many years of trouble free use.